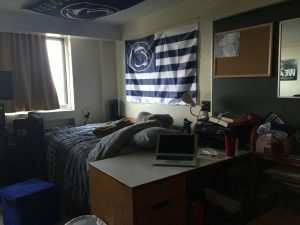 Penn State Lion Life – The Penn State student experience as told by Undergraduate Admissions bloggers. 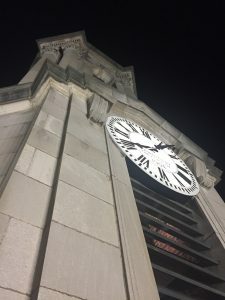 With the Early Action deadline quickly approaching, students are feeling increasing pressure to get their applications submitted and completed. However, Early Action isn’t always the best choice for a student. I’m here to give you a brief rundown on Early Action vs. our Priority Filing Date, also known as Regular Decision. The main incentive for people applying Early Action is they have the opportunity to receive an admissions decision a month earlier than those applying by the Priority Filing Date. Early Action: Deadline November 1st. Admissions decision by December 24th. Priority Filing/Regular Decision: Deadline November 30th. Admissions decision by January 31st. The evaluation process is the same for Early Action applicants and Regular Decision applicants. 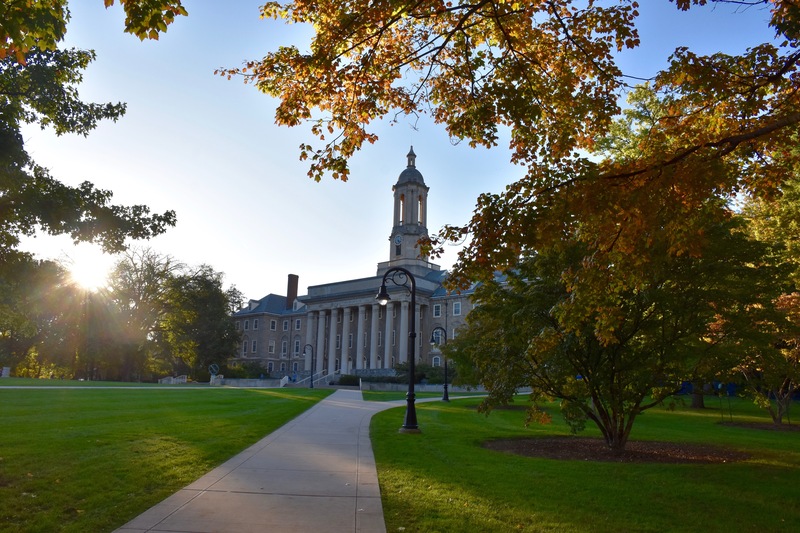 Applying Early Action does not mean easier acceptance to Penn State. Applying Early Action is non-binding, so submitting your application earlier does not show your eagerness and interest in attending Penn State. There are multiple decisions that could result from applying Early Action: admit, deny, or a deferral for a later decision timeline. My first suggestion when deciding whether Early Action is right for you is to take a look at your SAT/ACT scores. Often times, people want to retake these standardized tests once during their senior year to try and improve their scores. For most seniors this normally takes place in October. These October test scores usually arrive too late for participation in Early Action to be guaranteed. If this applies to you, and you find yourself feeling discouraged by your SAT/ACT score, retaking the test may be a good option for you, in concurrence with applying by our Priority Filing Date/Regular Decision deadline of November 30th. Applying using our Priority Filing Date/Regular Decision deadline also gives students more time to work on their application. Senior year is a busy time and you don’t want to rush through your college applications just to meet the Early Action deadline. Whether you need extra time to complete your Self-Reported Academic Record (SRAR), or you want to fine tune and perfect your personal statement just a little bit more, the Priority Filing Date/Regular Decision deadline gives you a few extra weeks to focus on your application and ensure you’re putting your best work forward for colleges to see. I hope you find this post helpful in distinguishing some of the differences between Early Action and Regular Decision, and in making the choice that works best for you when applying. If you have any further questions, feel free to send us an e-mail at admissions@psu.edu and we’ll be happy to guide you on the track we feel is best! 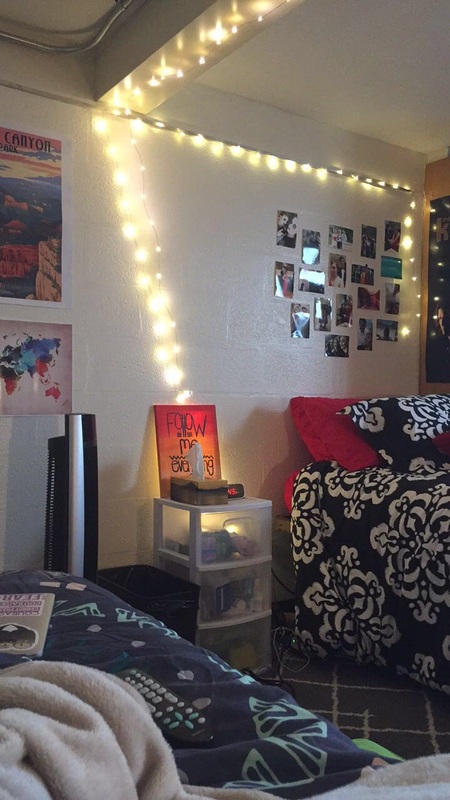 Let’s face it: dorm rooms aren’t the most beautiful spaces to live in. Cinder block walls, low square footage, and unmovable furniture can make your room feel downright dreary. Here are a few things you can do to make your personal space more, well, personal. Low-wattage institutional lighting isn’t the best look for anybody. The best solution is to BYOL- bring your own lights. String lights are a popular option for creating that ~mood~ lighting in your room. When used with desk lamps, string lights give off a nice ambience and provide enough light for you and your roommate to see without giving you the headache that your harsh ceiling light might. There are lots of options for string lights, ranging from the traditional white lights you might put up around the holidays to miniature lanterns in every color and style. 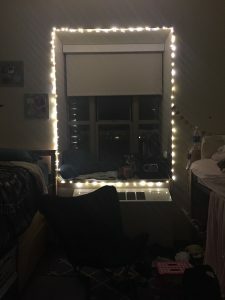 Personally, I use what’s called “fairy lights,” which are lighter than traditional string lights and are easy to hang up anywhere using scotch tape. Now that you have your string lights up, it’s time to do something about the blank walls staring back at you. A cute and easy way to fill wall space is a tapestry. There are lots of designs to choose from, so you’re bound to find something that matches your comforter. Another popular choice, especially for boy’s rooms, is flags that show off your Penn State spirit or pride for your home state. Posters and canvases are also a good way to decorate your walls and add some personality to your room. My favorite wall decoration is the pictures I have of me and my friends, both from home and from school. Whenever I’m feeling sad or stressed, it’s nice to be able to look up and be reminded of fun times when I wasn’t studying for an exam. Not only do tile floors look, well, not cozy, they get cold in the winter months and make for an unpleasant surprise when you pull the covers back and hop out of bed for your 8 a.m. A 5-by-8 foot rug placed between the beds can do wonders for your space. My only advice: stay away from shag rugs. They’re impossible to vacuum and you could possibly lose a fork or other kitchen utensil in them (speaking from experience). If you plan on having your friends over to hang out, or if you just want to sit somewhere that’s not your bed, buying a comfy chair is a great option. Although certainly not the most space effective option, most seats made for dorm rooms can fold up and be stored in a closet or under a bed when not in use (search for “butterfly chairs” or “saucer chairs”). Another great option for both extra seating and extra storage is an ottoman. It also makes a great step stool for those lofted beds! 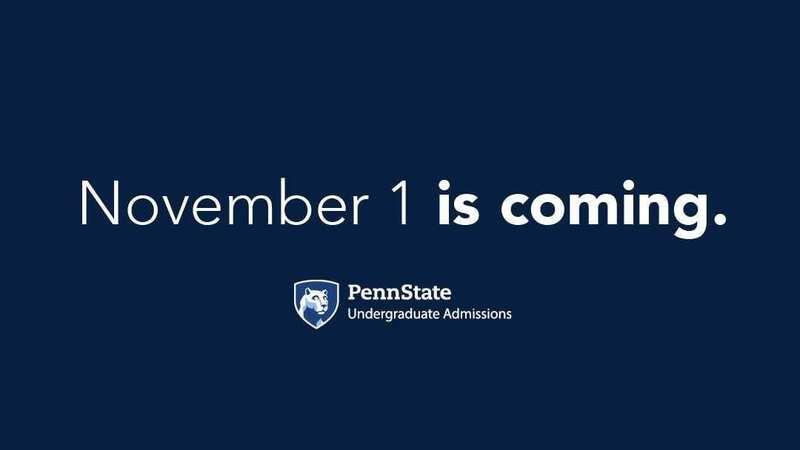 Penn State has accepted you, and you have accepted us! 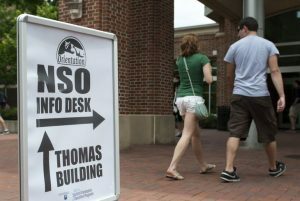 You’ve received your New Student Orientation date, and you may be nervous and not know what to expect. Well, good thing you came to this blog post! 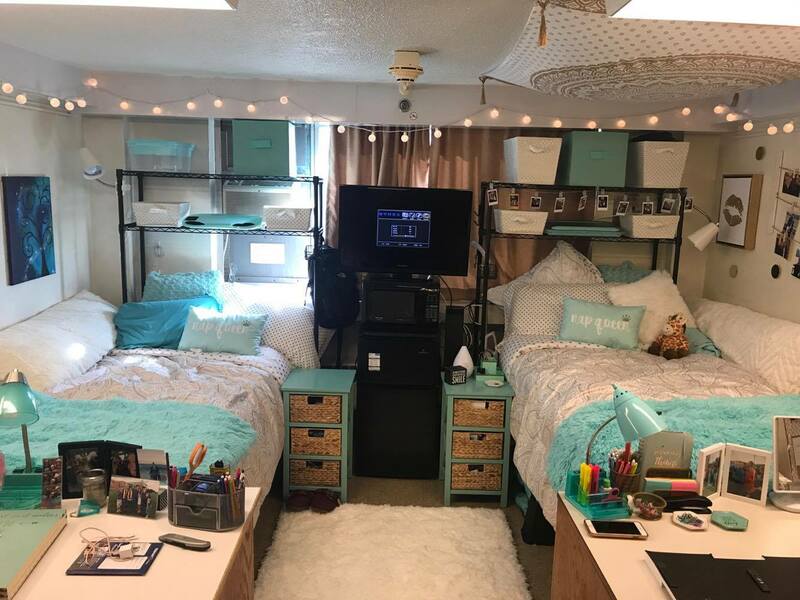 During new student orientation you will get to stay overnight in one of our residence halls and see what it’s like to live in a dorm. You will be with a roommate and an orientation group. For the overnight stay, you only need the typical necessities: toiletries, weather appropriate clothing, comfortable shoes (there is a lot of walking during NSO), and your phone charger. You will get to tour the campus again, and who doesn’t love strolling along our beautiful campus. You also get to bond with your group and share thoughts and feelings about leaving high school and starting your college career. 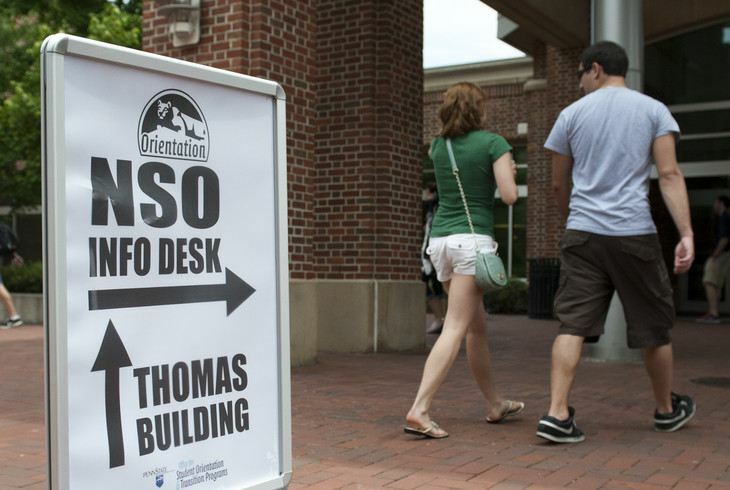 A bonus that many students have reported about NSO is that many find friends on that first day. 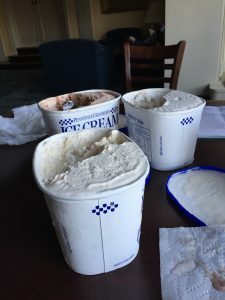 Then, after all the scheduled activities are finished, they meet up and go to the Berkey Creamery and walk around the rest of campus – the parts that are not on the tour route. This gives you a chance to familiarize yourself even more with campus before you get here for your first semester. So don’t be shy, which is easier said than done, but everyone around you is in the same shoes. Get the phone number or Snapchat of the person next to you! The second day is the most fun because you get to meet with an adviser from your college and plan your first semester! All of our advisers are very knowledgeable and helpful with making sure you are on the right path for graduation. We also have so many interesting and unusual classes that you may not have had in high school. For example, we have fun classes that complete the general health and physical activity credits. For example, you can take yoga or racquetball. In addition, you get to learn all about what Penn State has to offer, from financial aid to the technology services. After NSO, you’ll leave State College with some new friends to start out your college journey, fun new classes, and a better knowledge of the awesome University you’ll be able to call home. Meal Points and LionCash: What’s the difference? Shortly after arriving on campus as students for the first time, first year students quickly find out that there are two different ways to pay for things (namely food) on and around campus. Here is my attempt at explaining the differences between the campus meal plan and LionCash. What’s a meal plan and how do I pay for it? 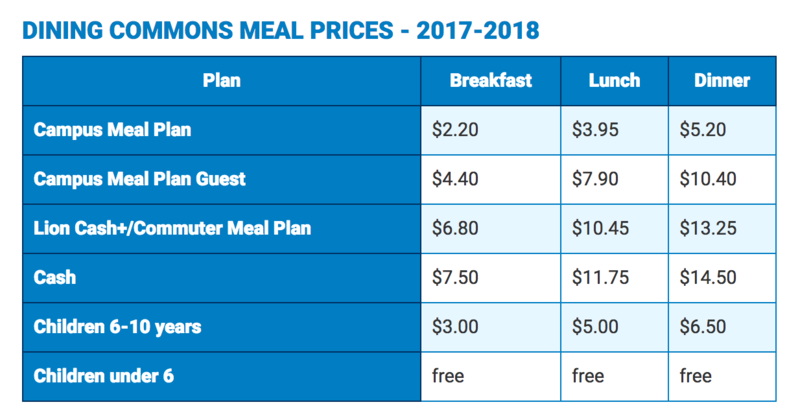 If you live on campus (which you will as a first-year student unless you are from Centre County and decide to live at home), you are required to purchase a meal plan to pay for your meals on campus. The meal plan is paid for through your bursar account, meaning you pay for it in the same bill where you pay for your tuition and room charge (the meal plan is the “board” part of the “room and board” cost you’ve heard about). You can use dining dollars anywhere on campus you can buy food: dining halls, the restaurants in the HUB, Beaver Stadium, the Bryce Jordan Center, convenience stores located mostly in residence hall areas around campus, and various cafes in academic building (Au Bon Pain is a popular one). How do I make the most of my meal plan? The best way to get the most out of your meal plan is to eat in the dining commons (there’s one in every residence hall area) as much as possible, since you are getting the 65% discount that you already paid for in the base cost. For example, paying for dinner at a dining commons with cash would cost you $14.50; with your meal plan, it’s only $5.20 because you have already paid the base cost. Is the meal plan based on “swipes” (number of meals per week) or on the amount of money? At the beginning of the semester, you will have your full amount of dining dollars available. There is no limit to the amount of meal points you can spend in a week. As the semester goes on, your dining dollars balance will decrease. You can check how much money you have left on your meal plan anytime on ELiving. So how is this different than LionCash? The biggest difference between the two is that while a meal plan is paid for with your tuition bill and is required if you live on campus, LionCash is completely optional (although you need it to do laundry on campus!) and can be loaded on to your ID+ card at any time. In addition, while you can use both meal points and LionCash on campus, stores and restaurants downtown (click here for a full list of businesses that accept LionCash) will only accept LionCash. Since there’s no base cost associated with it, you do not get the same 65% discount that you do with the meal plan; however, you do receive a 10% at most on-campus dining locations. What if I run out of meal points at the end of a semester? If you run out of meal points at the end of a semester, you can use LionCash to receive the discount since you already purchased a meal plan. Conversely, if you have too many meal points left over, you can decrease the level of your meal plan. Meal points carry over from fall to spring semesters, but any unused meal points at the end of the spring semester will be lost. Throughout the semester, you’ll notice that when your total account balance flashes on the screen after you use your meal plan, it is the total amount of meal points and LionCash that you have. This makes it easier not to have to worry about running out of meal points, since you can add LionCash at any time. While the difference between meal points and LionCash is not easily (or shortly) explained, once you’ve spent some time on campus it will all start to make a little bit more sense. Now go out and make the most of having so much food so close to your dorm! Penn State Dance Marathon, known around here as THON, is a year-long fundraising effort culminating in a 46 hour no sitting, no sleeping dance marathon held every February in the Bryce Jordan Center. With over 15,000 volunteers, it’s the largest student-run philanthropy in the world! While everyone who attends THON stays standing and dancing throughout the weekend, there are only ~700 “dancers”, who are on the floor for the full 46 hours. They represent different fundraising organizations (and were selected by those organizations) or are independent dancers (individuals who raised money themselves and entered a lottery for the opportunity). Because of the limitations on how many dancers there are, being selected as a dancer is taken very seriously and is considered an honor. THON benefits children with pediatric cancer, specifically the Four Diamonds Fund at Penn State Hershey Children’s Hospital. Four Diamonds helps offset the costs associated with cancer treatment that insurance doesn’t cover. Money from THON is also used to fund research in search of a cure for pediatric cancer. Since 1977, THON has raised over $136 Million for Four Diamonds. I keep seeing “FTK” around? FTK = For The Kids! That’s what it’s all about, after all! Is it just a University Park thing? While THON is held in the Bryce Jordan Center in University Park, fundraising happens at all campuses! Students from branch campuses are 100% eligible to dance in THON. How can I volunteer as a freshman?? To become an “official” THON volunteer (meaning that you assist in the planning and execution of THON weekend and the events leading up to it), you join a committee! There are 11 committees, including rules and regulations, hospitality and dancer relations. Applications are accepted in September, and the process involves an interview. What if I just want to help but I don’t want to join a committee? There are dozens of organizations that fundraise for THON! Some organizations only raise money for THON and some have a different primary focus (like a professional society or service organization) but also fundraise for THON. Greek life is also heavily involved! Can I still help out and go to THON if I’m not on a committee or special interest org? Absolutely! Throughout the year, there are several opportunities to contribute to THON’s cause without being part of a formal organization. It’s hard to walk through the HUB and not find a group selling something with the proceeds going to THON–in the past I’ve bought succulents, tutus, stickers, bows and bracelets! Sometimes it’s as easy as eating at your favorite restaurant on a specific day when a portion of your total are donated to the cause. Events like the THON football game, THON 5K and THON blood drives also help! Is it okay if I don’t want to be involved? Yes! It can seem like THON dominates campus, and there’s no denying that a majority of people have contributed/are involved in some way. THON is a great cause, but there are a lot of great causes out there! 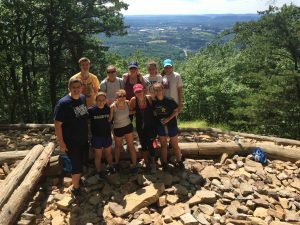 It’s important to find a cause that’s important to you and give back in some way during your college career, but your niche doesn’t have to be THON. If there’s two words in the English language that sound like they should never go together, it’s “summer” and “school.” So why do people at the Penn State Admissions Office keep talking about something called summer session? When I first heard about summer session, my first thought was “summer school? No thanks.” I was so happy when my application was accepted for the fall semester. Little did I know that only a year later, I would choose to spend a summer at Penn State after all. A few months into my freshman year, with my mom’s constant reminders that I needed to get a summer job echoing in my ears, I saw a poster in my residence hall advertising applications for LEAP Mentors for the upcoming summer. I didn’t know anything about LEAP when I applied for the job, aside from the fact that it was an option for incoming freshmen who were taking classes on campus in the summer. I thought about the people I met early in my freshmen year who did summer session; they were the people who took me to all the best restaurants in town, showed me how to use the buses on campus, and already had people who they were friends with before I even started classes. The more I looked into the LEAP program, the more I wished that I had done it before I started; it would’ve helped me not be so overwhelmed my first semester on campus (plus it would’ve saved me from having to work my summer job at home for the fourth year in a row). I talked to a lot of people and did a lot of Googling to find out more about LEAP, and I could not find anybody who said a single negative thing about the program. mentors had to go through. At the training, I met so many people who I hung out with all the time for the rest of the summer. Already, I had achieved my goal of making the campus smaller for myself in the summer. After mentor training ended, our groups of about 20 freshmen (called Prides) moved in. My LEAPers took CAS100A (a class that I hadn’t even been able to schedule yet) and Philosophy 123, a class on the ethics of media. Both classes had only the people in my pride in them (this is the same for all prides), and it was really cool to see my LEAPers (all of whom either lived on the same floor I lived on in Simmons Hall or in a nearby residence hall) grow close to each other as the summer went on. I hosted study sessions with free food before they had to give their speeches and answered any questions they had about Penn State, ranging from what clubs they should join in the fall to what the difference between meal points and LionCash is. 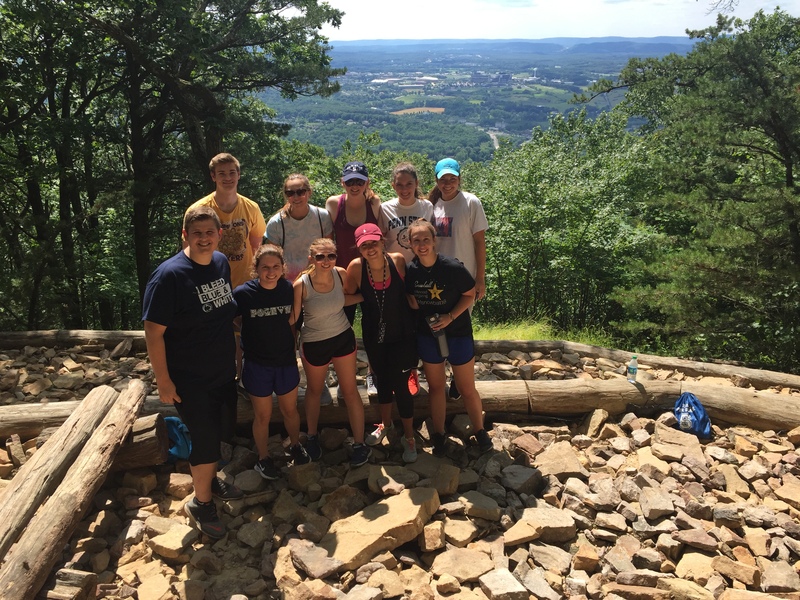 We even went on trips just for fun, like when we hiked Mount Nittany after the first day of classes. 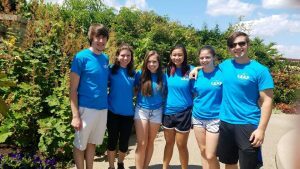 Every activity we did was paid for by LEAP, so we got to do things that aren’t usually free (like go to the pool or go ice skating) for no charge. Summer quickly became my favorite semester at Penn State; seeing the same people everywhere made it really easy to make friends, and the nice weather allowed me to fully appreciate just how beautiful Happy Valley is. A lot of the other mentors had done LEAP when they were incoming freshmen, and they all still talk to their friends from LEAP. Most of them decided to live with their friends from summer session their sophomore year and beyond. Even though I wasn’t enrolled in the program, the summer I spent with LEAP was the best summer of my life. I gained a lot of new friends and a ton of great memories. If I could go back, I would apply to Penn State with the understanding that summer session (whether you choose to enroll in a LEAP pride or not) is not a punishment, and it is not summer school. You are taking real classes and earning real credits (and real grades that count towards your GPA!) And if you do get accepted for summer and are on the fence about whether to do LEAP or not: why not start off college with a solid group of people to have study sessions (and eat lots of free food) with? Accepted your Offer? Time to Pick Housing! 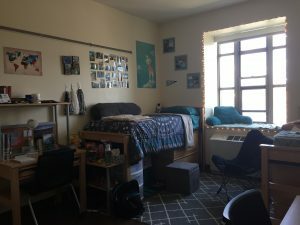 As an incoming student, one of the biggest concerns is housing. It is the first time many students will be living on their own in a new place. 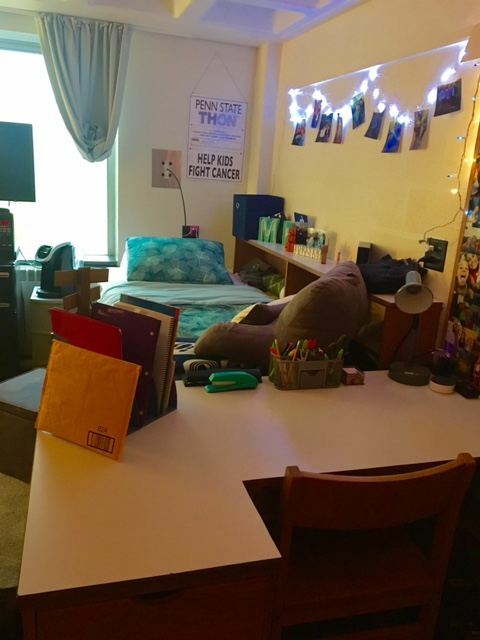 Luckily, Penn State has a ton of great housing options to make you feel right at home! 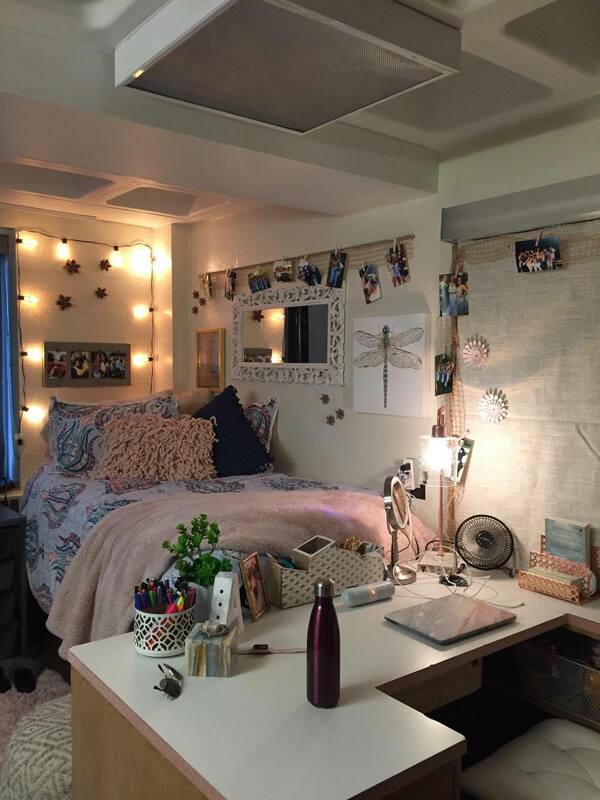 A traditional style dorm in East! 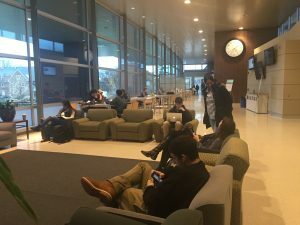 East – This is a very popular option among first-year students as it is the only part of campus completely occupied by first-year students. East offers a traditional living experience with double dorms and communal bathrooms located on each floor. The dining commons were recently updated, and now boast a new salad bar, deli, and sushi place! 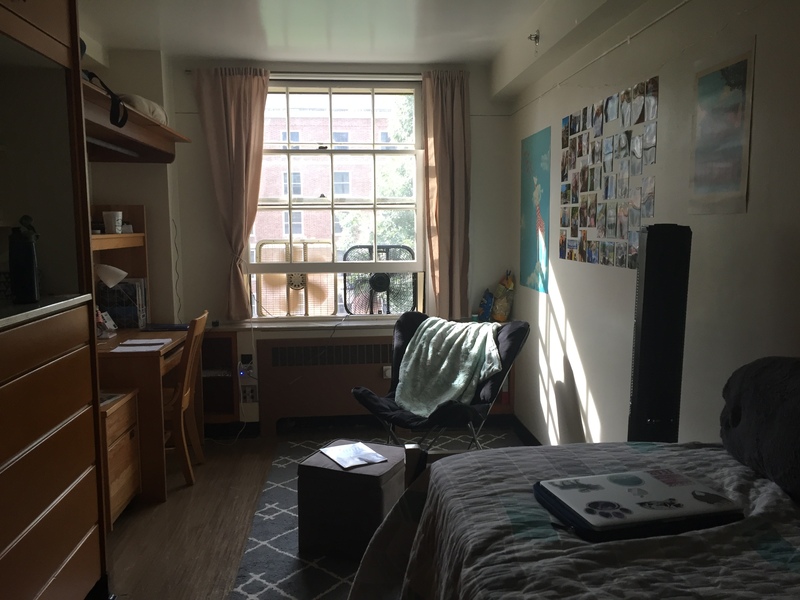 Many first-year students prefer the atmosphere of east and comfort of living among their peers. East is located near Beaver Stadium and the BJC – perfect for football games, concerts, and THON. West – West is filled with brick buildings and boasts a traditional collegiate feel. 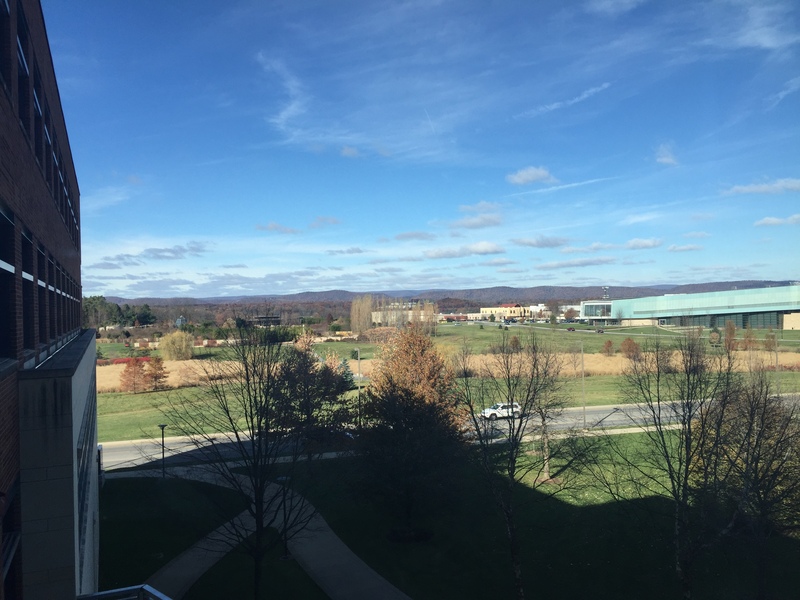 West is conveniently located near many classroom buildings, the library and Rec Hall (gym). West dorms are traditional style. Many claim that West dining commons bake the best cookies on campus! Pollock Commons has lots of great food options! Pollock – Pollock is another popular option among first and second year students. 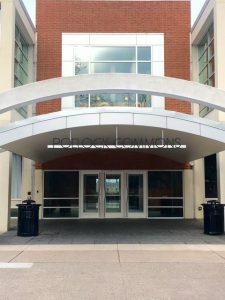 Pollock is conveniently located near the White Building (gym), many classroom buildings, and is not far from downtown. Pollock has a very good dining commons and computer lab. 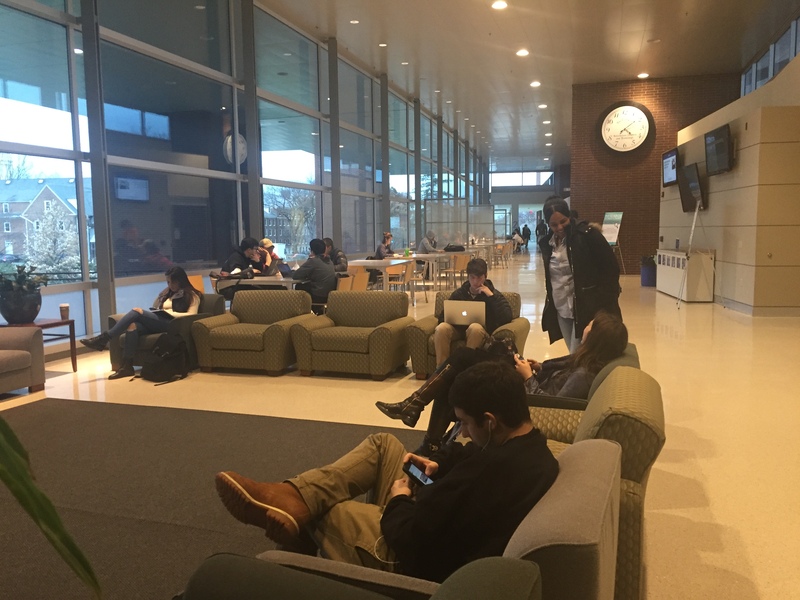 Within Pollock Commons is The Mix which is an extremely popular to-go restaurant! South – Much of South has been recently renovated. 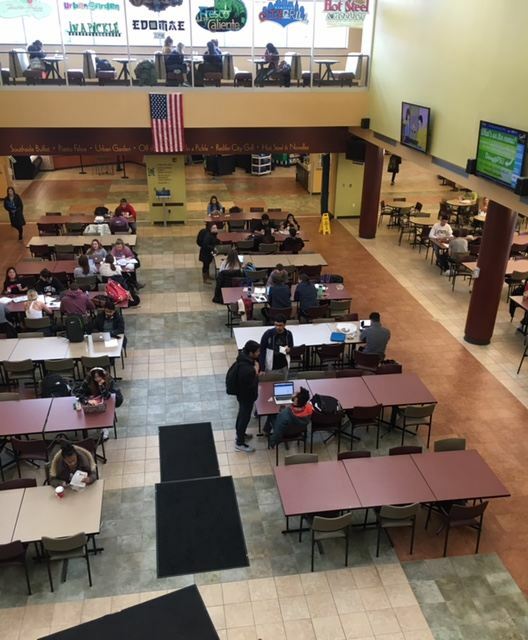 South dining commons offer a lot of different options from sushi to Italian. South is popular due to its close proximity to downtown amenities, such as shopping and restaurants. South also houses all sororities. While it is not common for many first-year students to live in South during the regular academic year, many students are housed in South during the summer session. Redifer Commons located in South has up to ten different dining options! 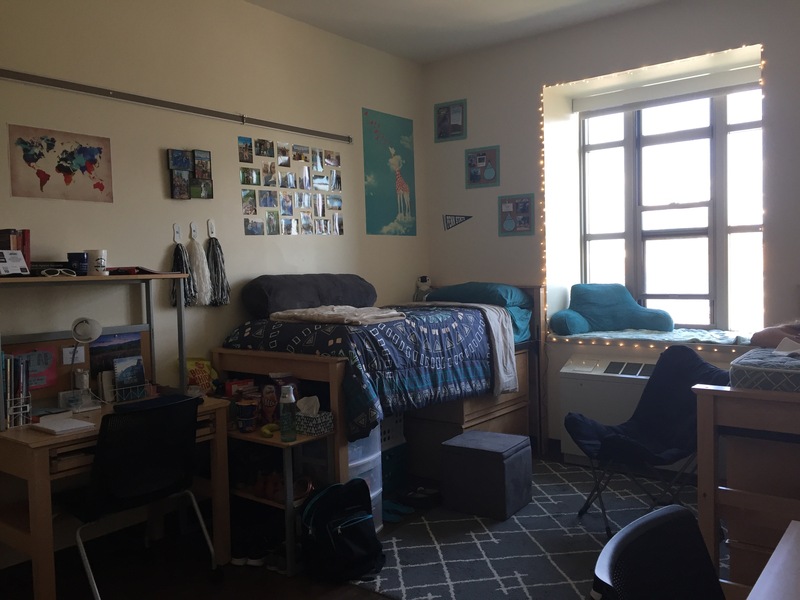 Nittany Apartments – Nittany Apartments give students the ability to live in an apartment while on campus. Each apartment has its own bathroom and kitchen. Nittany apartments are typically reserved for upperclassmen and athletes. Eastview Terrace – Do you need your own space? Eastview Terrace is the perfect option for you! Eastview Terrace is filled with single dorms. All of the dorms are comprised of a bed, dresser, desk, and private bathroom. 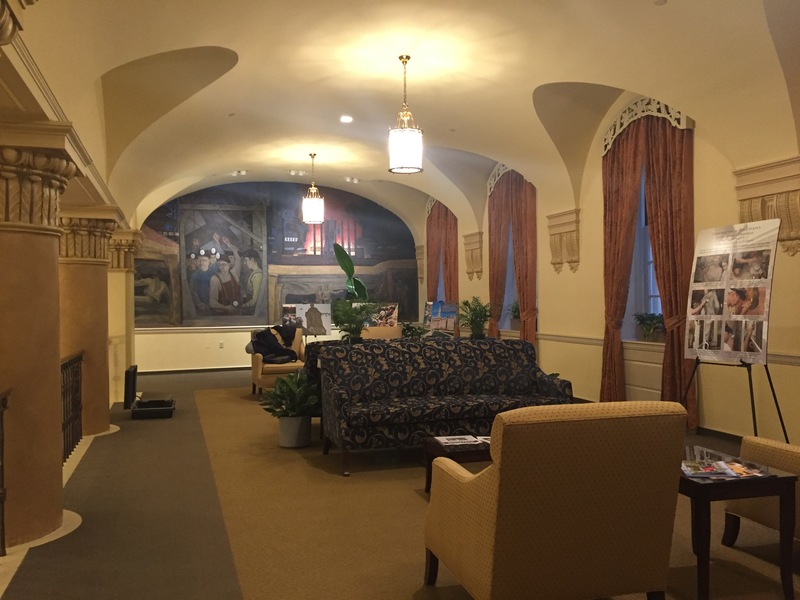 Every floor also has a common area and study space! 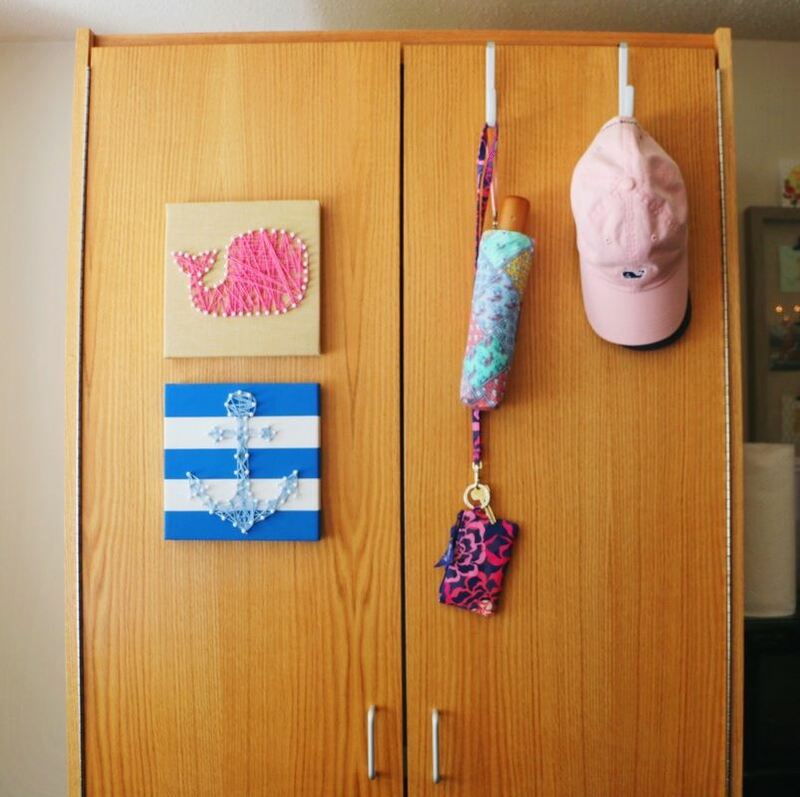 Each student gets a generous size closet within the suite! North – North is another area of campus conveniently located near many classroom buildings, such as the Business building. North is suite style which many students prefer. All of the suites have their own bathroom, which are cleaned by housing. Another perk of North is that the suites are air conditioned – perfect on those August nights! No matter where you choose to live remember that you will always be surrounded by tons of Penn State students, and have access to RAs who are always willing to help! 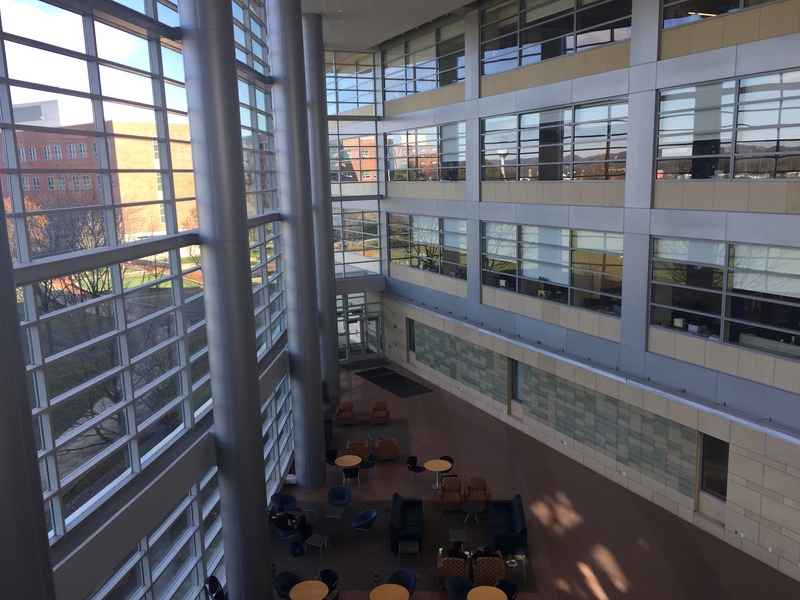 The Bio-Behavioral Health Building (foreground) and the Health and Human Development Building (background) offer sunny, quiet spaces to hang out and study. 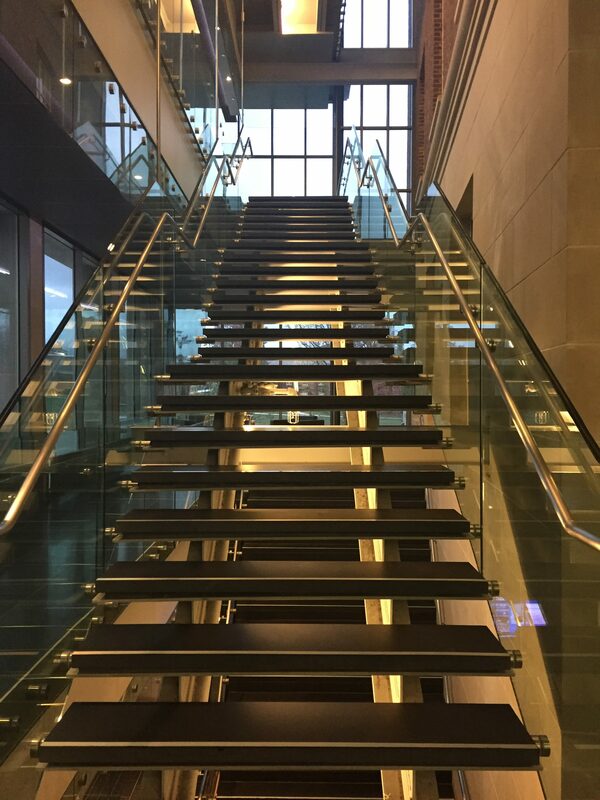 Staircase in the atrium of the BBH Building. Since these buildings were designed to look almost exactly alike, it’s fair to include them together. 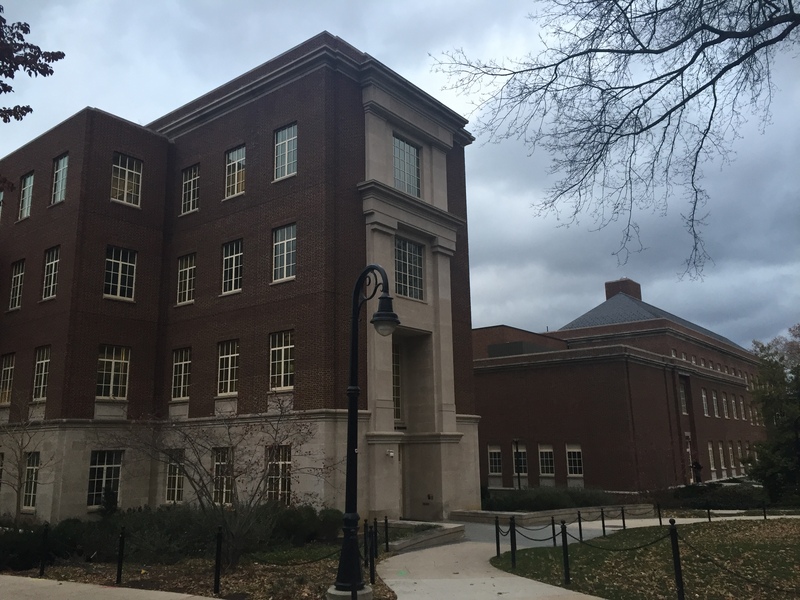 These buildings are some of the newest on campus; the BBH building was constructed in 2013, while renovations on the HHD building were completed in 2015. 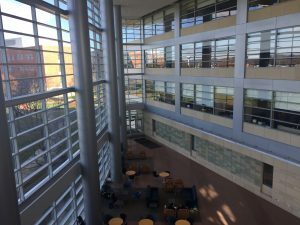 Personally, the HHD building is my favorite study spot on campus; it’s always quiet, and large windows provide views of College Avenue that are perfect for people watching. That’s not to say that the BBH building can’t hold its own in the views department; sunny days are perfect for watching people play frisbee on the HUB Lawn. On the inside, lounge chairs, tables, and a quiet atmosphere make focusing on work easy in both buildings. Atrium of the Business Building. View from the third floor, overlooking the Aboretum. Bird’s-eye view of the atrium. While not the most creatively named building on campus, the Business Building is certainly up there as one of the coolest. 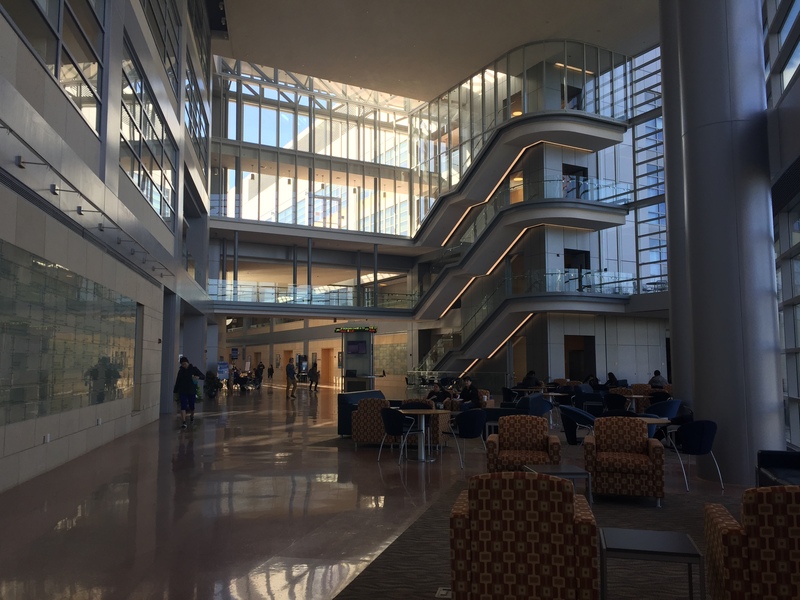 Home to the Smeal College of Business, this building is always full of students studying, clubs advertising events, and advisers helping students find jobs and internships. It’s also home to Blue Chip Bistro, in case you get hungry between classes or just need a study break. The atrium also features a stock market ticker! Outside of the Westgate Building. 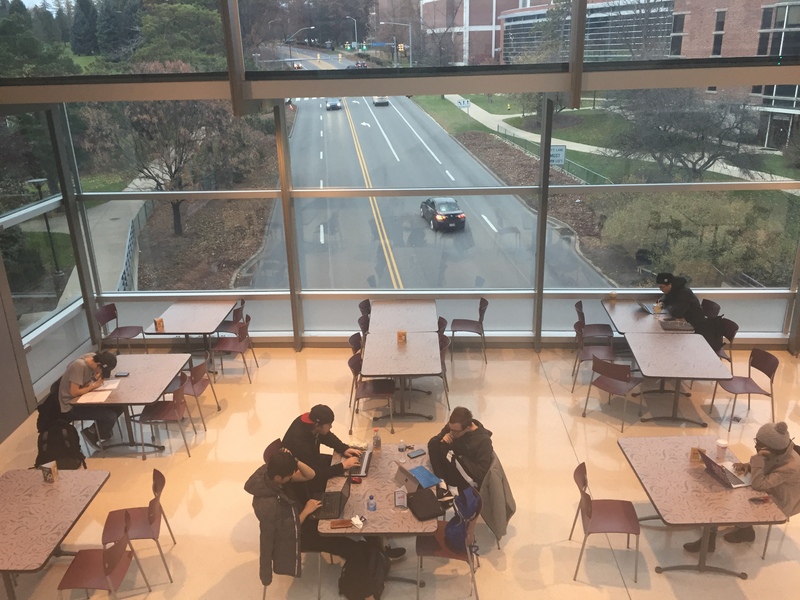 View of students studying over Atherton Street. Formerly known as the Information Services and Technology (IST) Building, in 2017 this building was renamed the Westgate Building. Home to IST and Security and Risk Analysis (SRA) majors, this is definitely one of the largest buildings on campus. 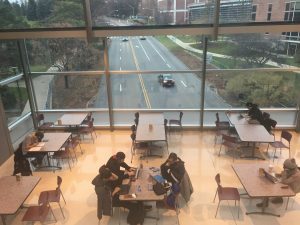 One of the coolest things about this building is the fact that it serves as a bridge over busy Atherton Street- nothing motivates you to study quite like sitting on top of 45 m.p.h. traffic! Student work lines the walls on the ground floor. 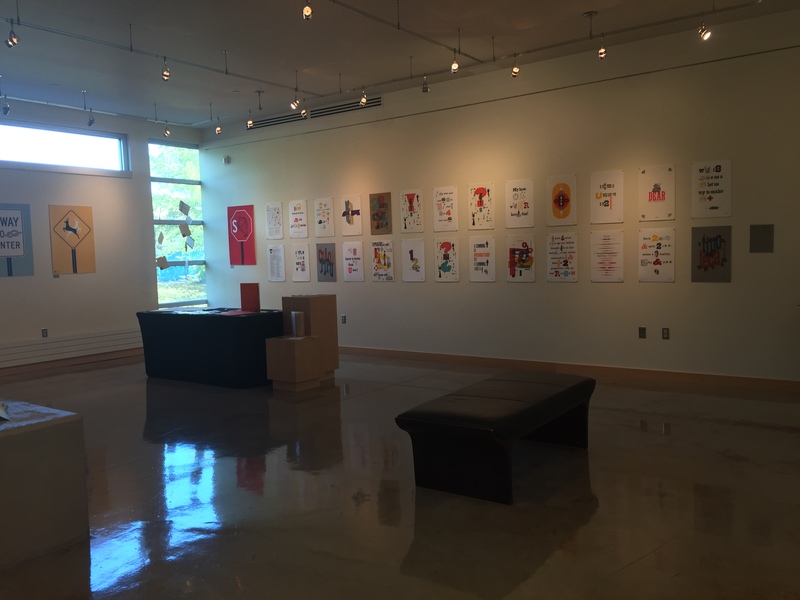 A gallery showcases different student work throughout the year. Home to the Stuckeman School for architecture, landscape architecture, and graphic design students, the Stuckeman Family Building is striking both inside and out. 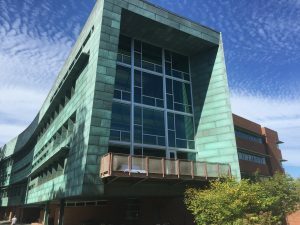 The green copper exterior makes it unlike any other building on campus, as does the work that goes on inside of the building. 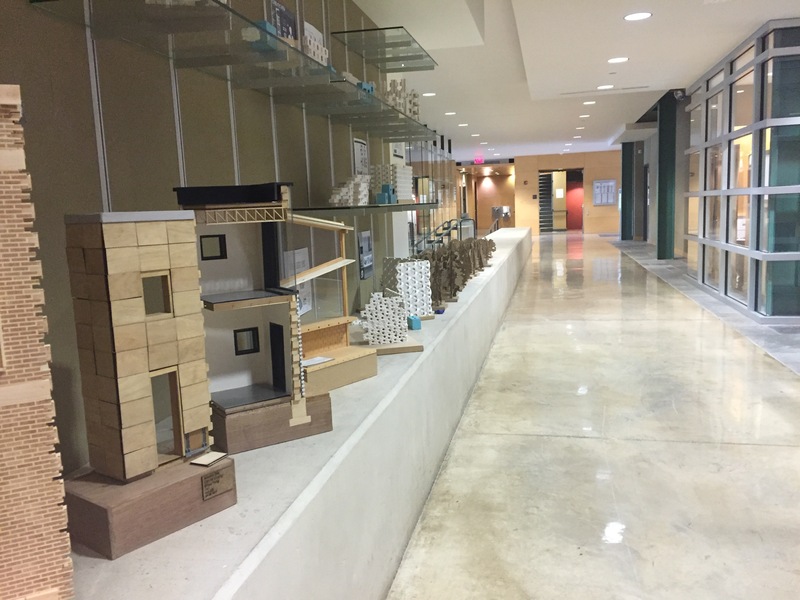 The ground floor is home to showcases of student’s work, from graphic design posters to 3-D architectural renderings. 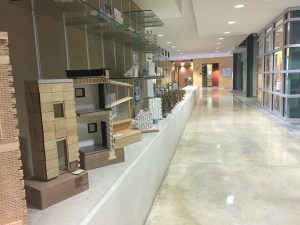 Upper levels of the building have studios for students to work on projects in. Though it may be tucked away on the north side of campus, those who know about the Stuckeman Building fall in love with its uniqueness. View of Old Main from its lawn on a fall afternoon. View right after walking in the front doors, featuring the famous Land Grant Frescoes. Upstairs hallway of Old Main. Up-close view of the clock tower at night. No list of cool buildings at Penn State is complete without mentioning the most iconic building on campus: Old Main. Built and rebuilt throughout the years, Old Main as we know it today was built in the 1930s and at one point included a student lounge and sandwich shop. 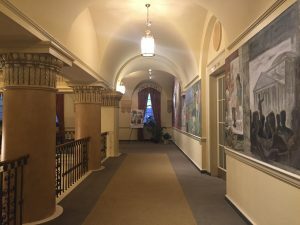 While today it is home to Penn State’s administrative offices, the building is still open to the public, who are welcome to come see the Land Grant Frescoes that were painted in the early 1940s. Penn State offers over 160 majors. How awesome is that? With this wide variety of choices, there certainly is a great fit for everyone. But what about those other classes students have to take that are not in their field or related to their major? What kind of options does Penn State have for these classes? “Those other classes” are referred to as “General Education” or “Gen Ed” classes. These include your general arts, sciences, and humanities. Some students do not like these courses, but there is no excuse for that! 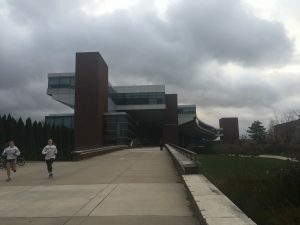 Penn State offers so many unique options that can enhance your learning experiences and provide you with new and interesting classes! There is even a whole website dedicated just for researching which classes are available! Let us take a look at a few of these classes, with insight from two professors and a student! A perfect class for those non-science majors with an interest in Astronomy! There is so much to learn about Astronomy and the universe, so why not spend a semester of your college career learning some basics? This class discusses everything from lights and atoms to the Milky Way! It is an introductory course and only requires basic mathematics skills, allowing students of all majors to have an ability to take it. It is three credits, and covers a general education, natural science credit! On top of that, Professor Charlton added that students should take Astro 001 not only to satisfy their Gen Ed requirement with a reasonable workload, but to “gain perspective on the meaning of their existence and their place in the Universe”. The amount of gen ed health/gym classes available is incredible. There are so many different interesting offerings that a whole blog post could be written on just those classes. From fly fishing, to ice skating, to introduction to different team sports you may not typically play (handball, pickleball, other “court sports”) Penn State offers a fantastic amount of activities. I chose to highlight “Beginner Downhill Skiing” because it is one of the most unique courses. Laura Gilham, with help of many Teaching Assistants nationally certified through the Professional Ski Instructors of America, instructs the course. Laura stated that “on-snow class sizes” are kept small to “optimize learning and keep it fun”. She also added, “You can’t learn if you can’t have fun”. When asked why students should take Beginner Downhill Skiing as their GHA, she said “It’s a great way to get out and have fun in the winter time!” along with “There’s more to winter than the frigid walks across campus.” If you want something to look forward to in the winter, this class may be for you! While choosing your general healthy and physical activity requirements (GHAs), be sure to take advantage of the unique offerings Penn State provides! Each is typically worth 1.5 credits and three are needed, so choose your top two favorite! Rolling with the idea of taking classes you may not have the opportunity to take again, explore all of the art options! GA or “General Art” education classes are part of graduation requirements, so find a fit that is quality for you to take! Junior MIS Major George Slater took the class INART 005 during his Sophomore year to meet this requirement, and provided some insight on the course. 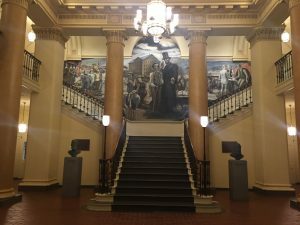 George said that students attend plays at theaters on campus or downtown in the evenings. Students must attend 7 plays out of a possible 10 during the semester and write reviews on them. The plays are typically offered Monday-Thursday. As this is my first semester at University Park, I have not had a full opportunity yet to explore all these different course options. I am excited to be able to schedule my last three semesters with so many diverse courses in mind and would encourage all students to invest time into finding classes they will find interesting! Remember, there is no excuse to only like the classes in your major, those other classes can be just as entertaining! Penn State is a big school that offers countless opportunities to join clubs, study abroad, and complete internships. But with so many options, it can be hard to dig through and find the best programs for you. Enter the Student Engagement Center, which just opened its physical space (appropriately called the Student Engagement Space) right in the middle of the HUB on campus. Mike Zeman, the director of the Student Engagement Network at Penn State, is in charge of making sure the Engagement Space is achieving its mission of helping students find experiences that will help them make the most of their time at the University. 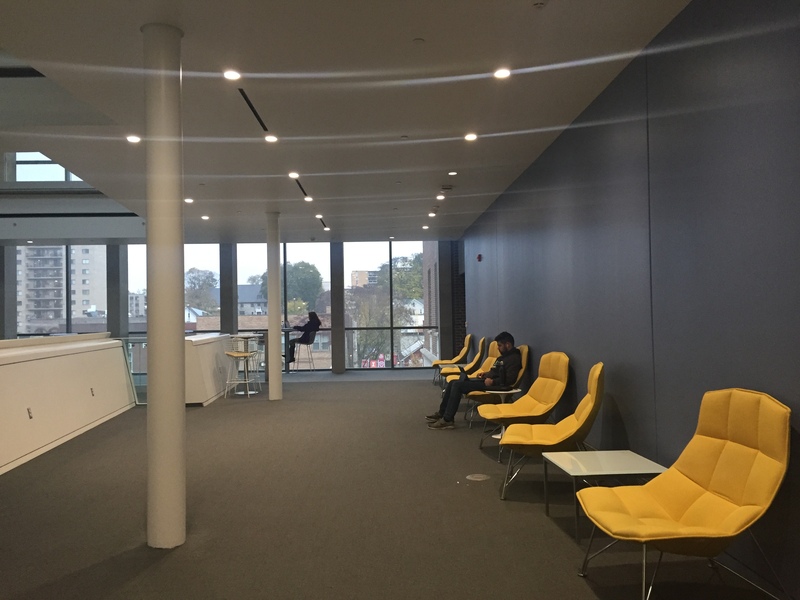 The new Student Engagement Space, located in the middle of campus in the HUB-Robeson Center, helps students find clubs, internships, and study abroad opportunities at Penn State. The Student Engagement Network has helped (and continues to help) students complete outside-of-classroom opportunities in part by giving out grants to students who wish to study abroad or conduct undergraduate research. 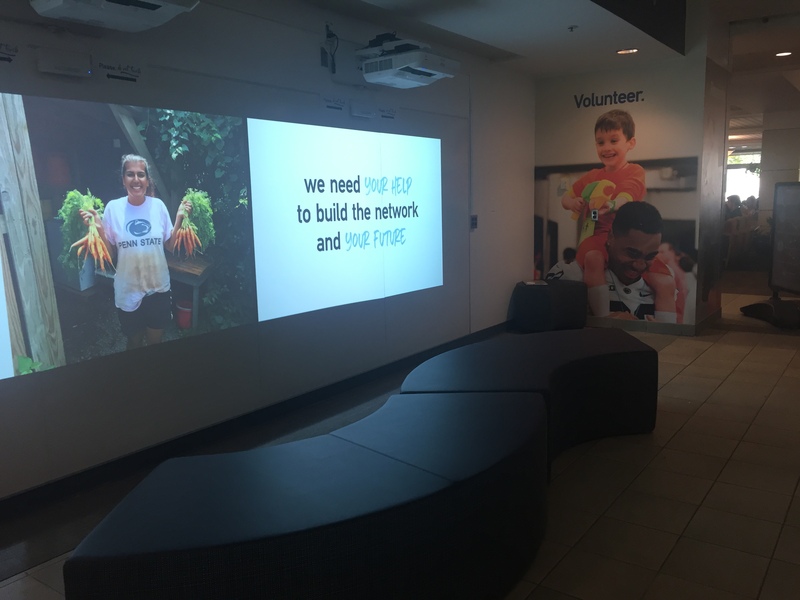 However, since it’s not possible to give a grant to every student, the Space is here to serve as a central place where students can walk in, talk to an intern about their interests and goals, and be directed towards opportunities they can pursue. In addition to the building of the physical Engagement Space, Zeman recently put in a proposal for an online Portal that he described as “something similar to Amazon,” where students can search for opportunities that exist both on and off campus. 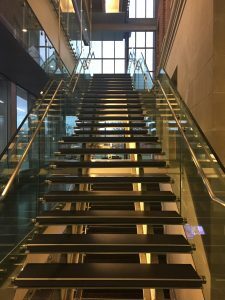 “We’ve been talking about [the online portal] being built using input from students in the [physical] Space,” Zeman said. Zeman went on to explain how an online portal would work. “Your personal preferences that you opt in to enter, your career interests, your personal interests, your courses, your course history, your history of signing up for student clubs and organizations, [those will all] inform the equation that we use to guide you,” Zeman said. In addition to being beneficial to students to find individual experiences, Zeman said the Space could also be used for clubs to reach out and work together with other organizations on projects and events. He described it as a kind of involvement fair that happens every day throughout the year. 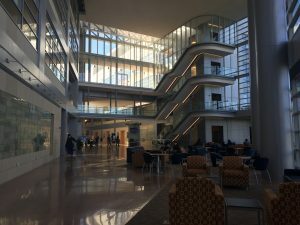 “[Penn State] is a big place, but there are mechanisms that will make you feel right at home with your interests,” Zeman said.